A dazzling bridal ring set for a dazzling bride. Both rings are carefully crafted in platinum and adorned with stunning diamonds. The engagement ring features as the statement piece, showcasing a radiant cut diamond in a cushion outline surrounded by a halo of smaller diamonds and a hidden diamond within the ring. Total diamond weight 1.5ct. Elegant diamond bridal jewellery, designed to dazzle. 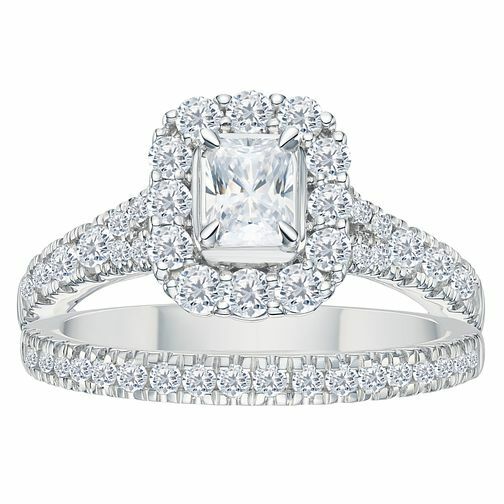 Platinum 1.5ct Radiant Cut Cushion Bridal Ring Set is rated 4.9 out of 5 by 11. Rated 5 out of 5 by Anonymous from Beautiful - I love it I did have a different ring not from Ernest Jones and diamonds repeatedly fell out, it was very delicate, thin and light but I chose it out as an engagement ring. Eventually we gave up with it and I had been searching for months for a ring that had everything I wanted for a good price. My size isn't usually in stock so had a little wait, the rings came earlier than expected by about 2 weeks early which was brilliant because I couldn't wait to get them. My expectations were based on my previous ring, so quite low. I opened the box and it was gorgeous, my last ring was thin 9k white gold and I didn't expect this ring to be so much heavier but I only see it as a good thing that it has a big of weight to it and a thick band making it feel more sturdy compared to my other ring. Like other reviews have said, the ring in person is so much more sparkly and nicer than the pictures, they really don't do it justice. I'm obsessed with anything sparkly so I really wanted a radiant cut diamond and it is very sparkly. My last ring took a lifetime to get any sparkle showing up or a good angle on camera when i got it, this ring however, a couple shots and it looked beautiful which I was surprised at since I thought it was my phone with the issue. It's absolutely gorgeous and I can finally say without a doubt I really do love my engagement ring now and I don't feel scared wearing this incase it breaks like my last one. I couldn't be happier with it!!!!!! Rated 4 out of 5 by Anonymous from Excellent ring So relieved that the item looked like the pictures as had purchased solely on what I had seen online. Very elegant design and would recommend.